In Vinyasa classes, the movement is coordinated with your breath to flow from one pose to another. Vinyasa styles can vary depending on the teacher, and there can be many different types of poses in different sequences. A dynamic system of practicing asana, integrating breath and movement in a heated room. Sun salutations are an integral feature of the class, with each class being a diverse mixture of asanas. This is a physically challenging class, practiced in the “hot room” (95-100 degrees), that ends with deep relaxation. A proprietary blend of all that you love about yoga in one unique-to-Yen Yoga class! Practice in our heated studio to increase the flexibility in each joint, muscle and cell. This class will be a challenging blend of vinyasa flow and traditional static postures; highlighting the breath and movement sequencing to draw you deeply inward and to leave you feeling completely re-energized and uplifted. It is a yoga practice which links breath and continual movement through a heat building sequence of postures. This practice combines a dynamic flow, static holds, inversions, core conditioning with rhythmic breathing (Ujayi Pranayama) for an intense, transformational body-mind workout. This slower paced, yet challenging, slow flow practice will help to build strength, stamina and flexibility. The slow flow will emphasize moving from the core using slow progressive, vinyasa sequences with longer holding standing and core postures. Builds heat, endurance, strength and flexibility and increases circulation. Sun salutations are an integral feature of the class, with each class being a diverse mixture of asanas. This is a physically challenging class that ends with deep relaxation. Yin yoga is a slow-paced style of yoga with seated postures that are held for longer periods of time. Yin is a great class for beginners, as postures can be held from one to four minutes. Yin can also be a meditative yoga practice that helps you find inner peace. The classes are relaxed, as you're supposed to let gravity do most of the work. This practice is 1/2 Vinyasa, 1/2 Yin yoga and will be in a warm room. It will begin with a slower paced, meditative, Vinyasa flow. In the Vinyasa sequences (the yang aspect or solar) you will direct your focus inward taking your time to feel yourself internally aligning and "marinating" in the release of prana. Also available in the hot room! In the Vinyasa sequences you will be led through mindful, fluid movements. 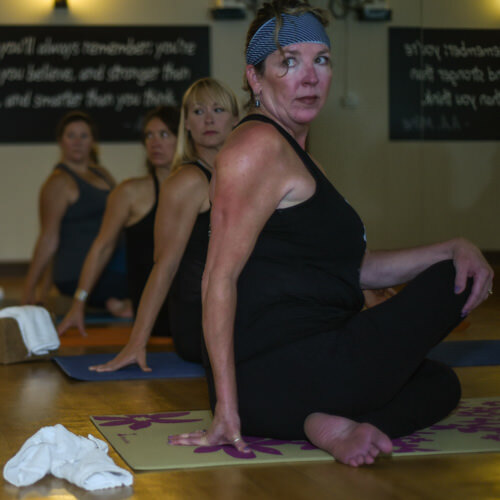 As we delve into a deeper level of awareness we will take our practice down to the floor for a yin practice, targeting the connective tissues of the hips, pelvis and lower spine. By balancing the solar and the lunar - strength and receptivity - you will find clarity, wholeness and deep peace. Some yoga experience recommended. In the heated room-Yin/Yang Yoga begins slowly, on the floor, accessing the pranic energy at the hips, pelvis and base of the spine. The yin approach is opposite of yang;­ rather than using muscular tension to go further, we first release deeply, using gentle but firm compression of the joints, relaxing whatever holds us back. Yin Yoga has the same goals and objectives as any other school of yoga; however, it directs the stimulation beyond the muscular ("yang") tissues, and instead targets the connective ("yin") tissues, such as the ligaments, bones, and even the joints of the body that normally are not exercised very much in a more active style of asana practice. 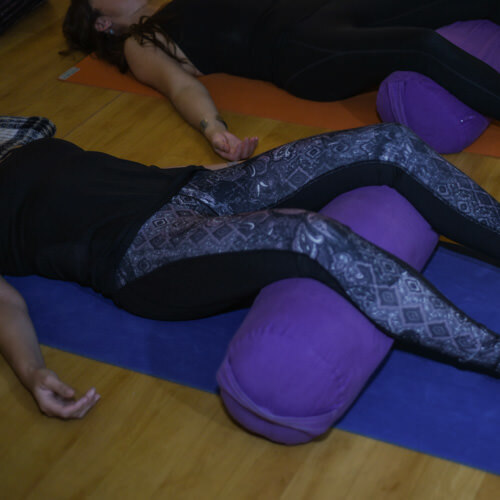 Yin Yoga generally targets the connective tissues of the hips, pelvis, and lower spine and is heated around 85 degrees to help facilitate deep lengthening. A slow and gentle practice that is perfect for beginners or anyone who wants to stretch and breathe in a calm environment. While exploring conscious movement and breath, you will not only improve overall strength and flexibility but also calm the mind attuning it to the inner light of awareness. 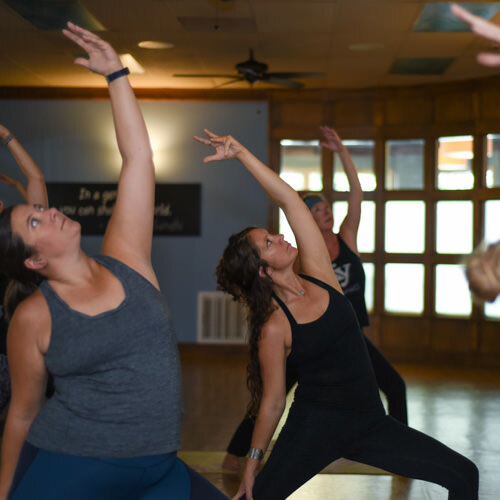 Explore • Awaken • Surrender • Energize • This class is a fun and gentle practice perfect for beginners or anyone in need of a good stress relief. We mix up styles and move from floor to standing positions using props, blocks and blankets to assist us into and out of the poses. All levels of fitness are welcome. Students will journey through a series of passive, meditative-type postures. Each asana will be held for several minutes to encourage a deeper sense of relaxation to the mind and muscles. The yoga postures are performed in a heated room to help you release toxins and systematically work every gland and muscle of the body. This practice is ideal for all levels, from newbies to the most advanced yogis. This class will open your body and mind to new health possibilities. Classes are available in 60-minute, 75-minute, and 90-minute formats. The room is heated to approximately 100 to 110 degrees with 20-30% humidity. No prior experience required. Our hot yoga class is a set of postures that deeply detoxifies and revitalizes every system throughout the body. The series of postures creates a deep meditation in movement and allows the body to focus on each posture as your practice progresses. A slower moving yoga flow class incorporating some of our traditional yen hot yoga asanas. Learn how to build heat internally through slow movement in your asanas and develop strength and stability moving into flexibility. We will balance, flow, and detox in a heated room. Unique movement combinations that stimulate the circulatory and lymphatic systems and help clear out toxins, and guided instruction for building your practice. This class Involves lots of juicy twists and asanas targeted to eliminate toxins from the body; resulting in an experience that will leave you feeling fresh, clear, and blissful! Warm room variation available! Explore the connectivity between mobility (the movement of joints), flexibility (the length of muscles), and the fascial system (the web of connective tissue that surrounds the muscles and joints). Increase and improve functional flexibility, overall joint health and gain a heightened sense of body awareness. 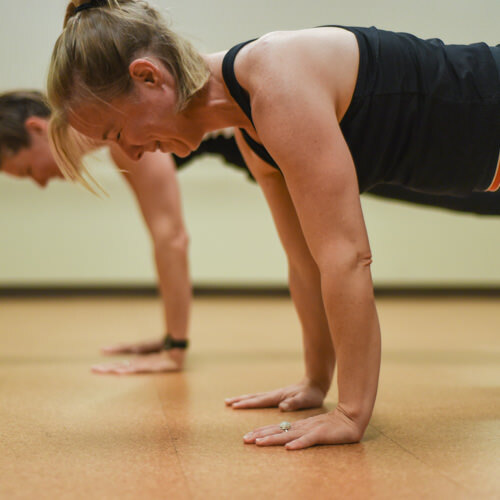 This energetic, vinyasa yoga based class seamlessly incorporates the lengthening, strengthening and toning principles of barre pilates into one harmonious class. This 45-minute fusion class will combine all the physical and mental benefits of yoga practice with bursts of high-intensity exercise and cardio between yoga flows. A great combo to activate slow-twitch muscle fibers with yoga, and fast-twitch muscle fiber activation with cardio bursts. Raise your heart rate and metabolism, strengthen and tone your whole body, and leave feeling grounded and centered. Yoga Nidra offers the experience of deep, meditative relaxation. You will rest deeply in savasana during guided meditation in a state between sleeping and awake, and will find a complete release of all body tension and a deeper level of consciousness, allowing you to access the deepest levels of your mind and examine your long held beliefs and habits. Condition your body and build long, lean muscles through a challenging and innovative sequence of exercises blending intervals of core training, yoga, isometrics and resistance work. 2-15lb dumbbells are often incorporated into class. Also available in the hot room! Myofascial release is a form of self massage that will utilize tools such as tennis balls and foam rollers to target imbalances, pain and knots in connective tissue. Improve overall body awareness, reduce muscular tension, improve range of motion, circulation and blood flow, and soothe the nervous system. The techniques learned in this class are useful tools that you can use at home and in everyday life to keep your body moving and performing optimally.